Michigan had eleven players start five or more games last year, everyone but Eric Puls got at least 5 starts. This much starting lineup variability is not optimal and with a team that returns so many players, it is unlikely that we will see a similar situation next year. John Beilein’s best teams have been extremely consistent with the starting lineup. For example, in 2006 John Beilein’s Elite Eight team had the same starters in 32 of 33 games, the one exception was senior night and Pat Beilein got the start. His 2005 team had four consistent starters and his 2007 team started the same five players every game. It is clear that Beilein would like to stick with one starting group and ride them as far as he can. There were circumstances last year, namely Laval Lucas-Perry’s eligibility situation, that made things a little more complicated but down the stretch Beilein found a group that worked: CJ Lee, Stu Douglass, Manny Harris, Zack Novak, and DeShawn Sims. That group started the final 10 games and went 6-4 including big wins over Purdue, Minnesota, and Clemson. Despite Michigan being a team that returns so much of their production (points, minutes, etc.) there is a remarkable number of question marks with the starting lineup. The only player who is really locked into a position is Manny Harris. The rest are question marks: Who starts at the point guard? Does DeShawn Sims play the four or the five? Does Zack Novak stick in the frontcourt or move back to guard? Over the next couple weeks, I’ll be going through each position and examining the candidates to play at each spot as well as some of the requirements of the position. Today, we’ll start with the point guard position. Beilein’s offense is called a two guard offense because it can be run without a true point guard. Instead of relying on a point guard to do all of the ball handling, the ball handling duties are distributed between both guards. That being said, in last year’s offense it was typically very easy to distinguish to point guard and the off guard. Kelvin Grady, Dave Merritt, and CJ Lee got the bulk of their minutes running the team while Stu Douglass played the point guard sporadically down the stretch. With Lee and Merritt’s graduation and Grady’s shift to the gridiron it’s back to the drawing board. There are some obvious strengths that you look for in a point guard – ball handling, passing, dealing with pressure, understanding the offense, etc. – but I think the key is defense. Whoever is the best defender will play, and play a lot. Stu is definitely not a prototypical point guard, he is much more of a natural two guard. I think he is best coming off screens for three point shots rather than setting up teammates. However, he has shown the ability to run the team for stretches. He is a competent ball handler and a surprisingly good passer. He isn’t going to get in the lane a lot but he should be reliable with the ball. Passing – Stu might not be a creator but he can get the ball where it needs to be. Stu also has the highest returning assist rate of anyone on the team besides Manny Harris. Stu is also probably the best on the team at getting the ball into the post. Experience – Stu has the most experience of any of Michigan’s point guard candidates. He went through a lot in his freshman year and knows Beilein’s offense better than any of the other candidates. He didn’t play the point guard a lot last year, but even a little bit is more than anyone else. Playmaking – Stu didn’t show the ability to get in the lane during his freshman season. He’s not going to drive and dish like Manny Harris can. Without this threat, Michigan’s offense isn’t nearly as dynamic. Trying to do too much – Stu still has to learn when to make the smart pass and when to make the fancy pass. Decision making is key in the backcourt and Beilein is going to stick with the guy who holds onto the ball. Less alley oops and more bounce passes. Judging by Laval Lucas-Perry’s summer plans, which included a trip to Point Guard College, he wants to get a shot running this team. Laval was thrown into the fire last year, he sat and watched as Michigan cruised to huge upset wins over UCLA and Duke and then tried to join the team in mid-December. Laval had his ups (early on and also at Minnesota) but he also struggled mightily at times. Throughout the Big Ten season I thought Laval looked lost within the offense, and often was thinking more than reacting with the ball. It’s important to remember that Laval is also only a sophomore this year and he definitely has potential to make a huge improvement. Shooting – Laval was streaky last year, but he has a pretty stroke and I think his shooting will be much more consistent this year. Defensive Potential – Laval didn’t really show it last year but I think he has the potential to be a great defender. He was a two sport athlete in high school and has reportedly dropped 10-15 pounds. If he can develop into a lock down defender, he will be on the court. Confidence & Decision Making – Laval never really looked comfortable in Beilein’s offense. This is partly expected due to his transition but it is definitely an issue. With time under his belt, it’s only a matter of time until the lightbulb clicks and the offense becomes more natural. Passing – Laval didn’t show much passing the ball last year. He posted an assist rate much lower than Stu Douglass and was essentially just a shooter. Hopefully as Laval becomes more comfortable, he becomes a better passer. He has shown more ability to get in the lane than Douglass, although his penetration often led to a circus shot. The Darius Morris hype continues to build and I am guilty of adding to it myself, but in my opinion he has earned most of it. Darius was recruited to be the point guard of the future, but I think his role this year really depends on how quickly he adjusts. His skill set is unique to this team, a penetrating guard. If he can do the little things and understand the offense, it will make Michigan a much harder team to defend. I think that Darius is too good to keep off the floor and although it might take him a while to “click”, he will find his way onto the court. Playmaking & Penetration: Darius’ game thrives off getting in the lane and making plays for himself or others. This is absolutely huge and what sets Darius apart from the other candidates. 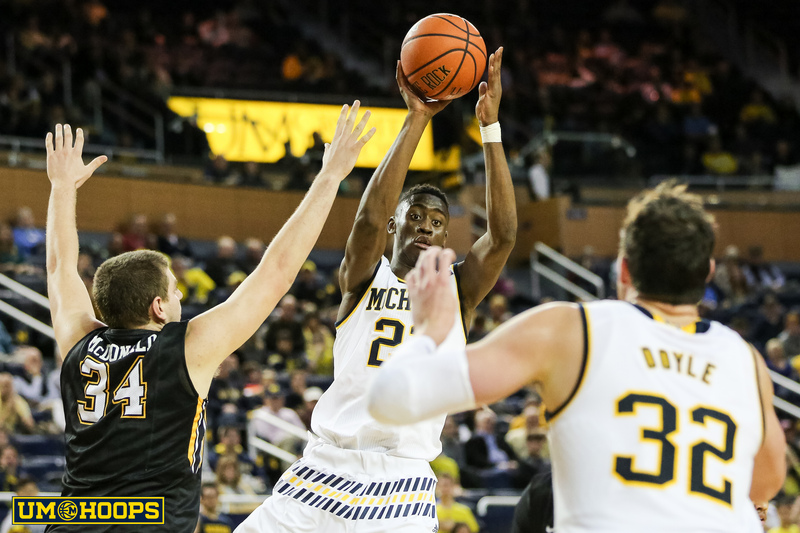 Size – Darius has the size to be a great defender in Beilein’s defense. He looks to have gotten stronger and at 6-foot-3 he should be able to hold his own a little bit more on the bottom of the 1-3-1. Experience — Playing well against high school competition isn’t quite the same as playing Division 1 basketball in the Big Ten. Darius doesn’t have any experience in Beilein’s system yet and Michigan fans will be hoping he is a quick study. Shooting – While this isn’t the primary concern at the point, shooting isn’t a strength of Darius’ game like it is for Stu and Laval. I think we will see Stu Douglass start at the point guard early in the season but I am confident that we will see Darius Morris starting by year’s end. Laval will get a shot but he just hasn’t shown me anything to make me believe he projects as a point guard long term. Stu doesn’t either, but at this point I think he’s more ready for spot-duty. Let’s hear your thoughts, who starts at point guard on November 14th? December 31st? March 6th?